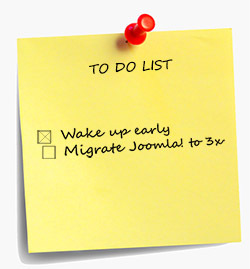 If you have a Joomla! site you have probably heard it by now - MIGRATION. It might have always been there, breathing down on the back of your neck but preferred to not look back as it might be something scary. If this is the case, you were half right - it sounds scary but you can be prepared. A lot of fuss was made when Joomla! 2.5 reached its end - basically it won't get any new updates. Don't worry this has happened before with Joomla! 1.1.x and 1.5. There are a couple of articles (Joomla! doc, magazine article) out there that will explain the benefits of walking down the migration path, but none of them state the obvious - costs and a considerable headache will be associated with this action.